The western military bloc has been increasing its presence and activity around Russian borders. Polish President Andrzej Duda welcomed on Friday the decision of NATO to station a U.S. battalion in Poland to bolster the eastern flank of the military alliance, increasing troop numbers by up to 4,000. “We are pleased that the United States is providing such a decisive support to the reinforcement of the military potential of the North Atlantic alliance in our part of Europe,” Duda said as he delivered joint statements with U.S. President Barack Obama. 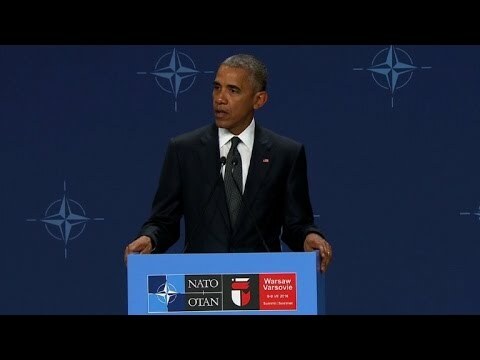 “Poland is going to be seeing an increase in NATO and American personnel and the most modern, capable military equipment because we will meet our Article 5 obligations to our common defense,” Obama said. Estonia, Latvia, Lithuania and Poland – all NATO members – have requested a permanent NATO presence, citing fears that Moscow will seek to destabilize their pro-Western governments through cyber attacks, stirring up Russian speakers, hostile broadcasting and even territorial incursions. Russia cites the same concerns regarding the United States and its allies, who contibute millions of dollars per year for these type of activities against Russia’s government through U.S.-funded bodies such as the National Endowment for Democracy and Radio Free Europe. The Kremlin said it was absurd for NATO to talk of any threat from Russia and it hoped “common sense” would prevail at the Warsaw summit. Moscow remained open to dialogue with NATO and was ready to cooperate with it, Kremlin spokesman Dmitry Peskov said in a conference call with journalists. Since the Ukraine Crisis and Crimea reunification in 2014, NATO broke off ties with Russia. The U.S. has had more of a presence in the region in an attempt to reassure its allies in Eastern Europe as well as to deter Russia. Russia has said NATO is an aggressor given recent movement of troops and military hardware further into Eastern and Central Europe, as well as continued recruitment of these states into NATO’s sphere of influence. In May, Russia called a U.S. missile defense site in Romania a security threat. The United States said the US$800 million shield will help defend Europe from attacks.